Lacuna has made this stunning Lingerie set for My Attic. It has appliers and also system layers, so you can look super fabulous. I love the colours available and the lime green really shouts out to you. As they are only 95L during the event you can get as many as you can carry out the door. 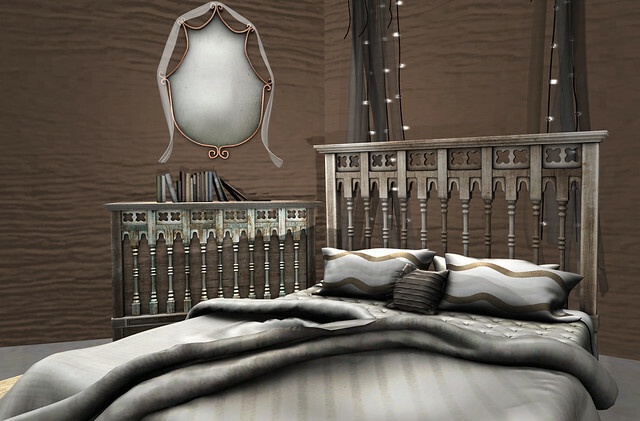 This stunning bedroom set is by Cheeky Pea, it is a stunning mix of items,and I just loved the earthy tones in this one, there was another option more colourful in the boho theme of last Uber, but this one won me over. The bed is so neat too, it is scripted to have the bed linen fold down when you lay on it, and it has a lot of poses for great pic oppurtunities, or you know sleeping and stuff. I am wearing the Lana hair from LeLutka but I did play with it a lot with my tablet, because I have to get used to that thing, and my shoulders were getting chilly. Wearing one of the COMING SOON LeLutka heads with the Clean skin appliers on it. You will get the clean option in every make up skin package when buying your appliers for these heads, so that is a definite win, when you consider all the looks you will be able to create once you build up a collection of make ups in the future.